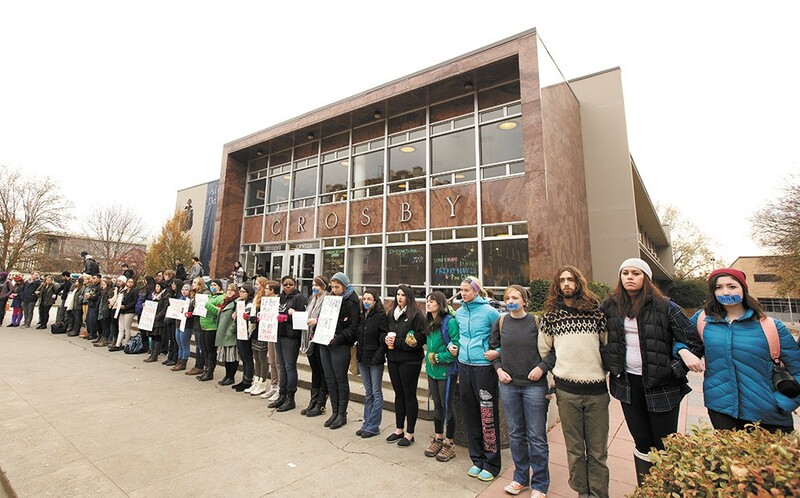 Students demonstrated in front of Gonzaga's student center to call for policy changes and draw attention to a national statistic that one in four college women have been raped. After two weeks of students calling on Gonzaga University to better address sexual assault, the school's TITLE IX COORDINATOR resigned unexpectedly last Wednesday. GU officials declined to give any details about why Sarah Green, who had been tasked with overseeing all reports of sexual assault on campus, left. Green, who was hired this summer, told the Inlander earlier this month she was willing to consider the student group's policy proposals, though she expressed skepticism about their demand that any student found to have committed sexual assault be immediately expelled. Student organizers say they haven't been given any reason for Green's departure and first learned of it when she didn't show up to a student-led event she'd agreed to participate in. Now, they're asking the administration to include them in the process of hiring her replacement. "We want to have a stronger voice in how things are dealt with to restore trust [in the administration]," says Meg Besch, one of the leaders of the student movement. "Having a voice in hiring the person creating the policies that keep us safe or don't keep us safe is something that needs to happen." A new report from the federal Centers for Medicare and Medicaid Services has identified several deficiencies at Lakeland Village, a state-run institution in Medical Lake for people with DEVELOPMENTAL DISABILITIES, less than a year after finding more than 40,000 legal violations at the facility. The latest CMS report, issued to the Washington Department of Social and Health Services and the Developmental Disabilities Administration in October, cites several troubling findings: Six residents were found "tied to a chair" and "unattended for extended periods of time" in front the television. One resident was observed with a pressure sore and was neglected treatment for five and half weeks. CMS also found examples of staff members falsely documenting treatment for residents that never occurred. A similar CMS report released last year found that Lakeland Village broke federal law more than 40,000 times over a two-and-a-half-year period by failing to provide adequate services to more than two dozen residents. "We are concerned that things just keep getting worse and not better," says David Carlson, director of legal advocacy at Disability Rights Washington. "DSHS should think really hard about whether or not it should continue to dump money and resources into a failing program or get people into settings that can better meet their needs." John Lemus, of People First of Washington, a developmental disability self-advocacy group, organized a protest Tuesday outside the DDA office in Spokane. Lemus said he would also like to see Lakeland Village closed and residents moved into community settings. After a year of data analysis and interviews, the U.S. DEPARTMENT OF JUSTICE has finished a draft report on the Spokane Police Department's use of force and potential policy reforms, but few city officials have seen the results. DOJ representatives briefed just a handful of officials on their findings last week while most city councilmembers, community groups and the public were left to wait for a final report next month. Council President Ben Stuckart, one of the few briefed on the report, says the DOJ review of police conduct did not result in any surprise findings. He says the DOJ revisited more than 240 use-of-force incidents and nine officer-involved deaths. "It seemed very thorough," Stuckart says, noting the report appeared to be about 100 pages, but he did not receive a copy. Councilman Jon Snyder, who chairs the city's Public Safety Committee, says he and other officials were not invited to the DOJ briefing. While Stuckart passed along some findings, Snyder notes that the collaborative police review process has proven somewhat unclear at times.